For courses in Networking/Communications. 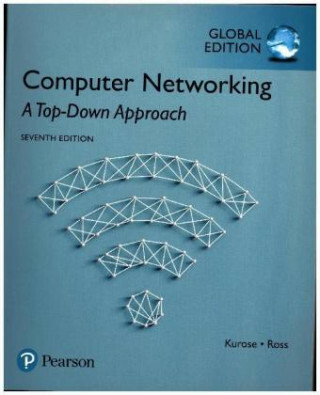 Motivate your students with a top-down, layered approach to computer networking Unique among computer networking texts, the Seventh Edition of the popular Computer Networking: A Top Down Approach builds on the author's long tradition of teaching this complex subject through a layered approach in a "top-down manner." The text works its way from the application layer down toward the physical layer, motivating students by exposing them to important concepts early in their study of networking. Focusing on the Internet and the fundamentally important issues of networking, this text provides an excellent foundation for students in computer science and electrical engineering, without requiring extensive knowledge of programming or mathematics. The Seventh Edition has been updated to reflect the most important and exciting recent advances in networking. MasteringComputerScience(TM) not included. Students, if MasteringComputerScience is a recommended/mandatory component of the course, please ask your instructor for the correct ISBN and course ID. MasteringComputerScience should only be purchased when required by an instructor. Instructors, contact your Pearson representative for more information. MasteringComputerScience is an online homework, tutorial, and assessment program designed to work with this text to engage students and improve results. Interactive, self-paced tutorials provide individualized coaching to help students stay on track. With a wide range of activities available, students can actively learn, understand, and retain even the most difficult concepts.